Albio Arm Sling Pouch (Tropical) holds, supports and immobilizes the sprained, broken or surgically operated arm in the flexion position while it recuperates. A sleek and a smart design ideally suitable for tropical countries with hot and humid climatic conditions. Smart, sleek, does not cover the chest, improves ventilation, comfort and best suited for hot climates. Durable and non-tearable, plush looks, wrinkle free and soft to feel. 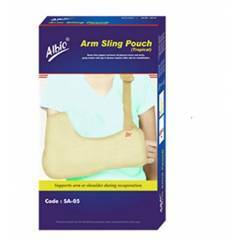 Albio SA-05 Tropical Arm Sling Pouch Hand Support, Size: XXXL is a premium quality Arm Supports from Albio. Moglix is a well-known ecommerce platform for qualitative range of Arm Supports. All Albio SA-05 Tropical Arm Sling Pouch Hand Support, Size: XXXL are manufactured by using quality assured material and advanced techniques, which make them up to the standard in this highly challenging field. The materials utilized to manufacture Albio SA-05 Tropical Arm Sling Pouch Hand Support, Size: XXXL, are sourced from the most reliable and official Arm Supports vendors, chosen after performing detailed market surveys. Thus, Albio products are widely acknowledged in the market for their high quality. We are dedicatedly involved in providing an excellent quality array of Albio Arm Supports.